The Nikon F6 replaced the Nikon F5 as the company's top professional-grade film SLR in 2004. Due to the rapid adoption of digital technology by professional photographers after this date, the F6 is probably the final 35 mm film F-series camera. The camera body was styled by Giorgetto Giugiaro, who designed all Nikon F bodies since the Nikon F3. Unlike all previous F-series models, it does not feature an interchangeable viewfinder system. This may be an asset, as it is much simpler to seal the camera against moisture and dust. 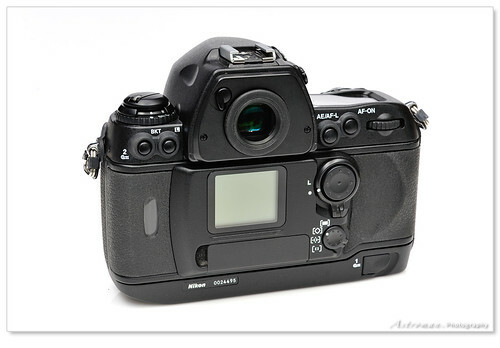 It general, the camera closely resembles the styling and layout of the Nikon D2-series digital cameras. One especially nice feature is the replacement of the removable covers for the PC-sync and 10-pin connectors (which were easily lost) with permanently fixed rubber covers. This is the only Nikon 35 mm film camera which features the iTTL OTF flash system. Therefore it is compatible with the latest generation of Nikon flashes, including the Nikon SB-900. Unlike the Nikon F5 the Nikon F6 supports matrix metering in "A" and "M" mode with Nikon Ai and AiS manual focus lenses and therefore works with almost any Nikon F-mount lens manufactured since 1977. The Nikon F6 can be modified by Nikon so that pre-Ai lenses can be mounted. The Nikon F6 can be operated without the vertical handgrip, which is an intrinsic part of the Nikon F5 body. This makes the Nikon F6 much more compact than the Nikon F5 and about the same size as the original Nikon F4 with the MB-20 battery pack. The Nikon F6 comes with the data back built in. This data back features a display, which looks similar to that of a digital camera and can be used for the customization of many of the camera's features. Data can be imprinted inbetween images, an important feature, which most users leave always on. The Nikon F6 features the Nikon Multi-CAM2000 autofocus module, which is also used in the Nikon D2 camera series. The Nikon F6 features a "silent" film transport mode (CS mode), which advances the film a bit slower but notably quieter. 11 selectable autofocus areas, can be combined into "areas"
Like all other F-series models by Nikon, the Nikon F6 is a professional camera and built extremely solid. It can take a lot of abuse and should last users a lifetime. Like the Nikon F4, the Nikon F6 can handle Nikon Ai and AiS series lenses very well, therefore it is an ideal addition to any manual focus camera collection. The flash system on the Nikon F6 is unmatched by any other 35 mm film camera. This is another reason why users might look to add a Nikon F6 to their camera collection with F-type lenses manufactured since 1977. The only annoying feature on the Nikon F6 is the fact that the self timer and the mirror lock up are enabled by the same dial and therefore exclude each other. While in mirror lock up, the camera automatically fires after 30 seconds, but this is not really a good compromise. A cable release can be connected to the 10-pin adapter to raise the mirror and fire the shutter button earlier. Otherwise, the camera is probably the best Nikon F-series camera ever built. This is also supported by the price level of used Nikon F6 cameras. This page was last edited on 12 January 2018, at 11:30.